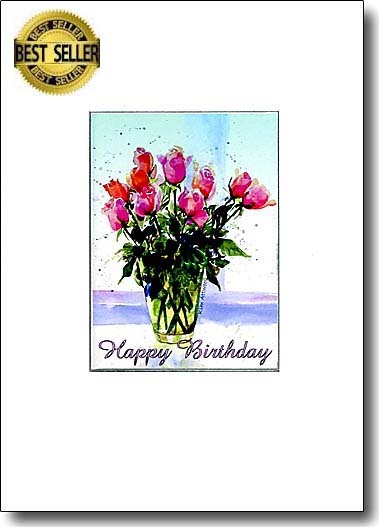 Giving handmade Birthday Cards shows that you have made that extra effort to make someone's "big day" that much more special. 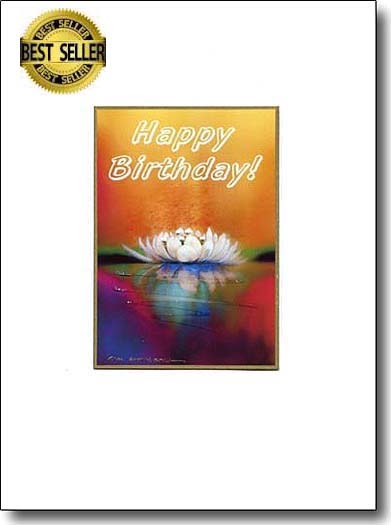 This bright card shows sparkles on the glass bowl. It gives its message with a punch of contrast. Are you smiling already? 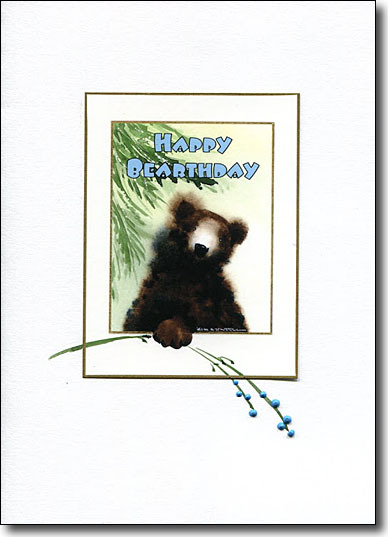 Such a playful way to wish big cuddly bears happy birthday. 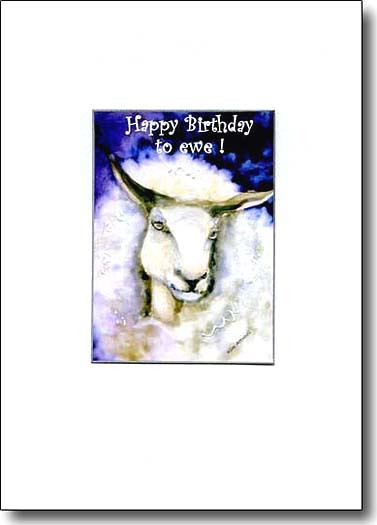 This painting, done on gesso...unique for watercolors.. has become several different greeting cards because I love substituting Ewe for you. It always brings a smile! 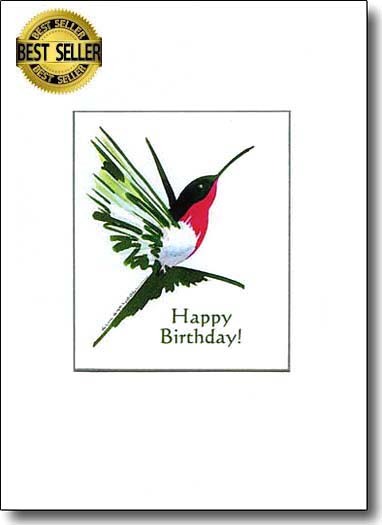 This hummingbird has long been a favorite of my Mom. 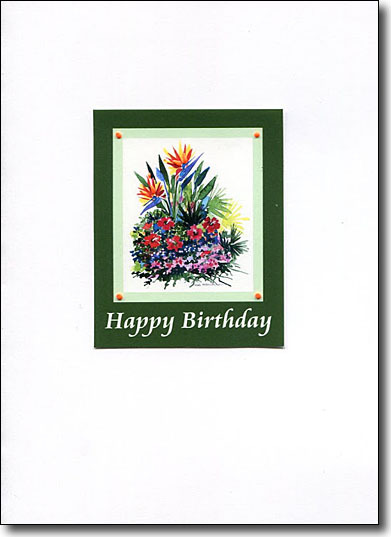 It became a Special Day card for the first time, on her birthday. Its wings are embellished with sparkles. 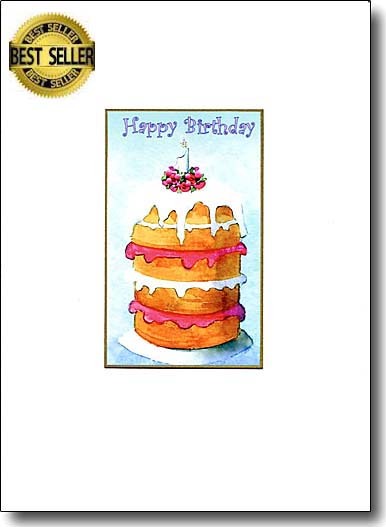 Here is a very whimsical belated birthday card. 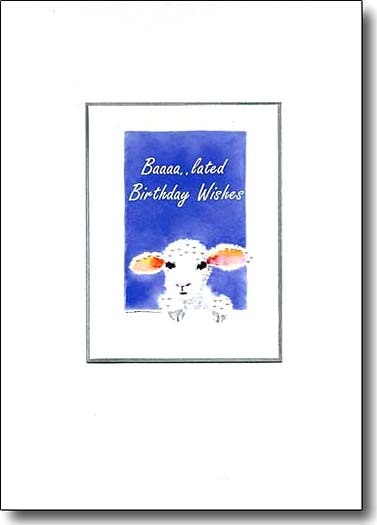 You're sure to be forgiven for your oversight when you send this dear little lamb. 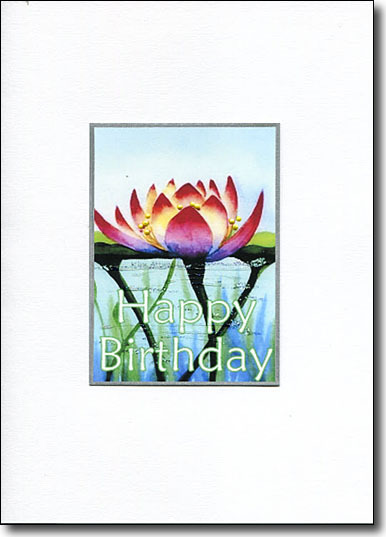 The Lotus means many things; one of them is good fortune. Buddhists revere this flower. 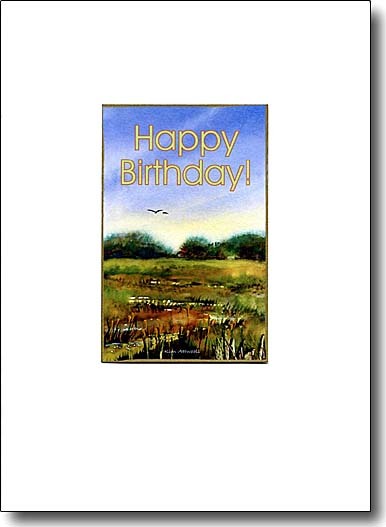 I thought it fortunate to add "Happy Birthday" to this painting. Here's a dramatic painting that makes a stunning impact. Every one has a rushing waterfall to further capture your attention. 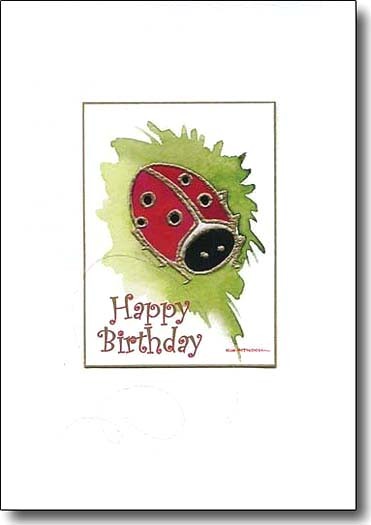 Lady bug lovers will be tickled pink to receive this whimsical image. 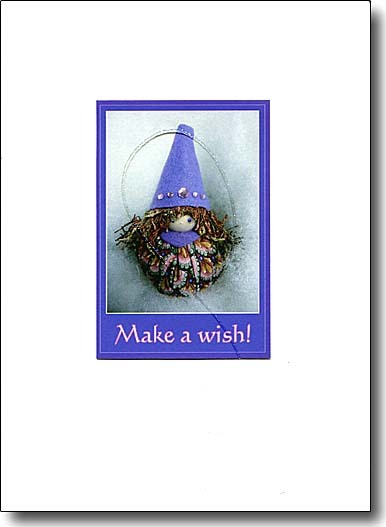 The font was chosen to compliment the playful image and the little bug has sparkly eyes. 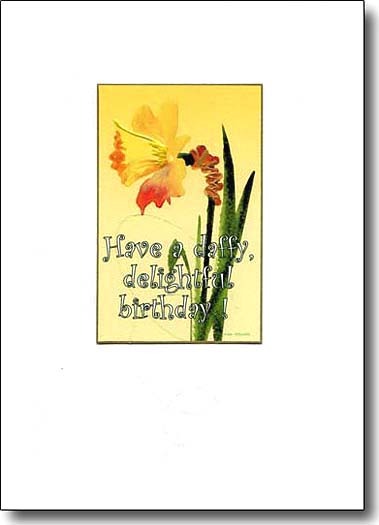 Brighten a friend's day with this energizing daffodil and the playful good wishes splashed across it. 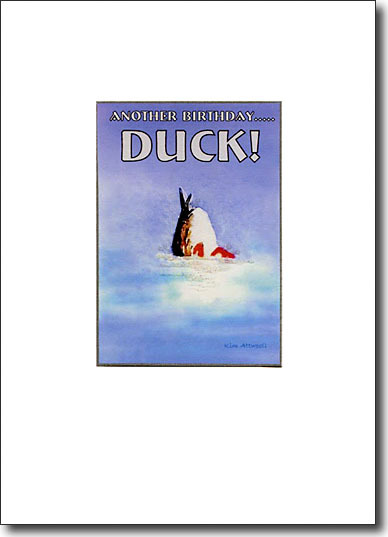 This dramatic card is perfect to delight adventurers of all ages. Give them a picture of paradise for their special day. 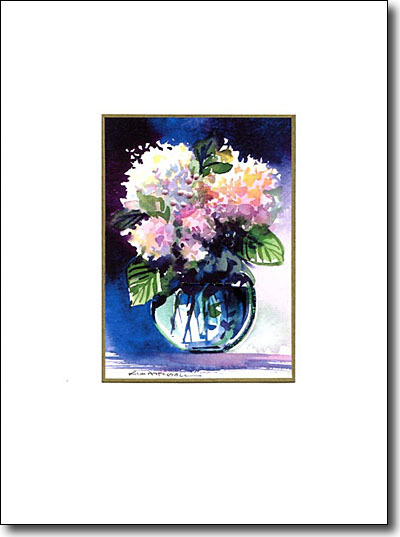 Send a striking image with this bright watercolor where I enhance the water with sparkles. This playful creature brings magic to your wishes. 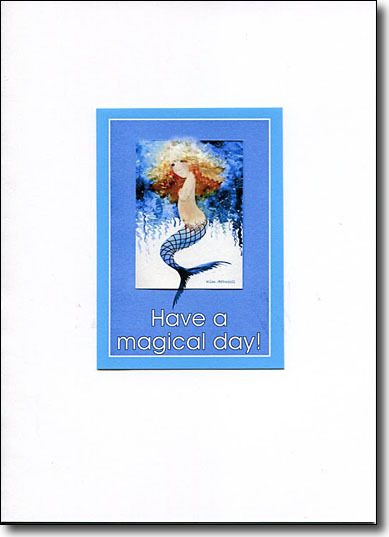 It's a whimsical card embellished with sparkles. 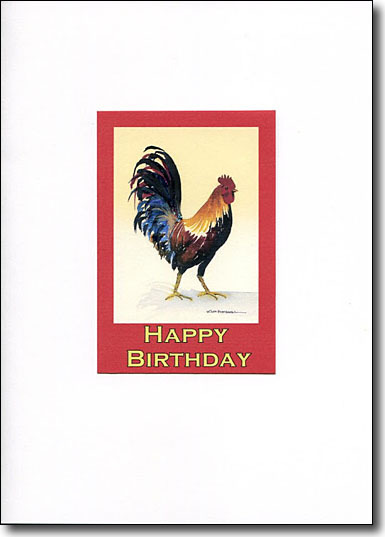 What man won't be delighted to receive this handsome rooster card for his special day? Here is a relaxing landscape of a house with a view. 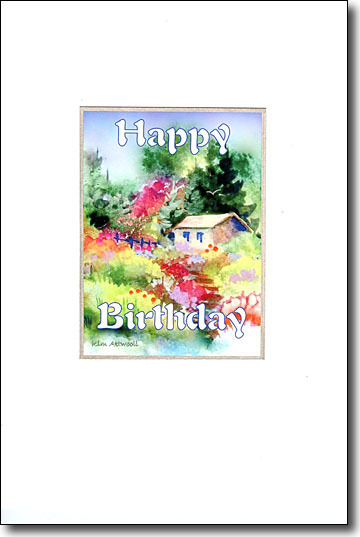 There are bright flowers in the garden, two birds flying by and birthday wishes to make the escape a celebration. 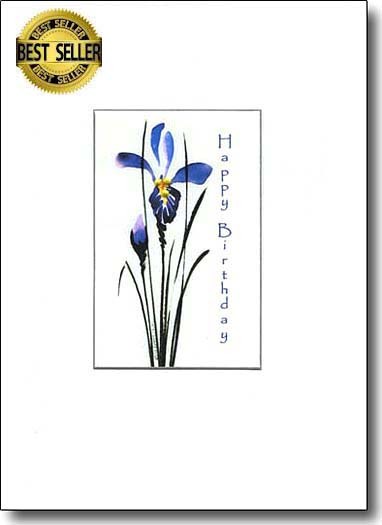 The iris card is sophisticated and enhanced with a raised mustache of yellow. Send this to your friends who love flowers. 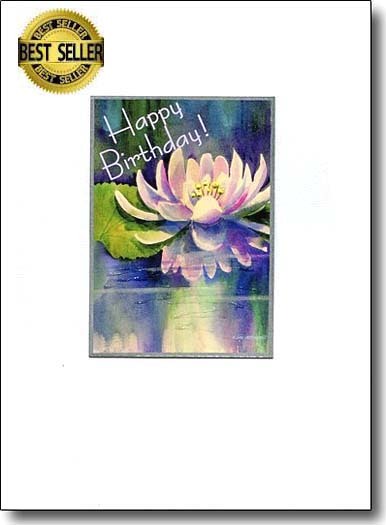 Here is an artist's birthday cake that is sure to delight painters and crafters. The English expression "Just Ducky", means perfect in every way. 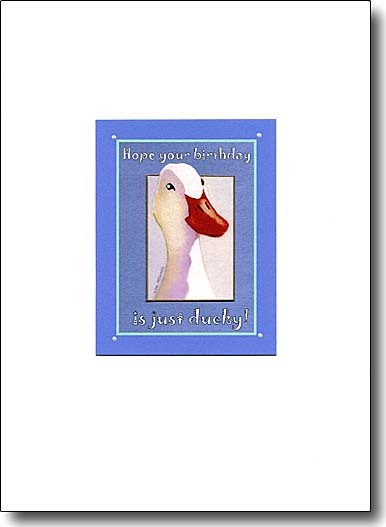 My duck portrait conveys these birthday wishes with whimsey and humor. Make a wish. 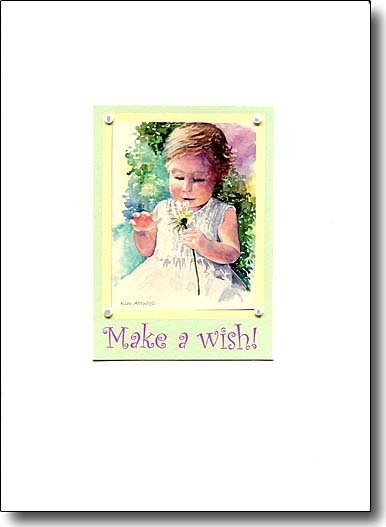 This little girl is picking daisy petals and is a sweet birthday card for children of all ages. 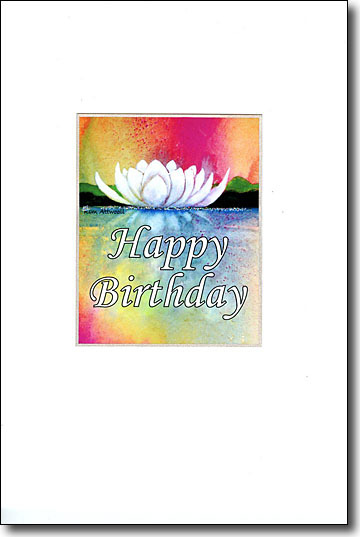 Here's a very rich image that jumps with bold colors, yet conveys a peaceful image. 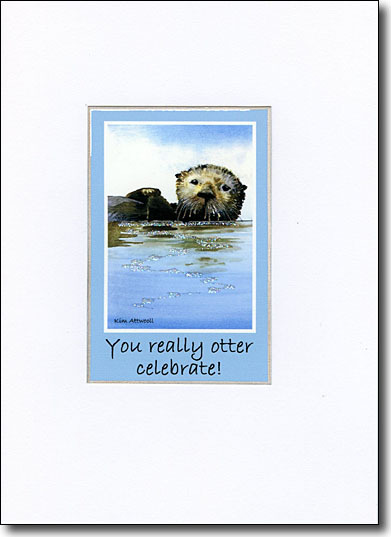 It will outshine all other cards on the mantlepiece! 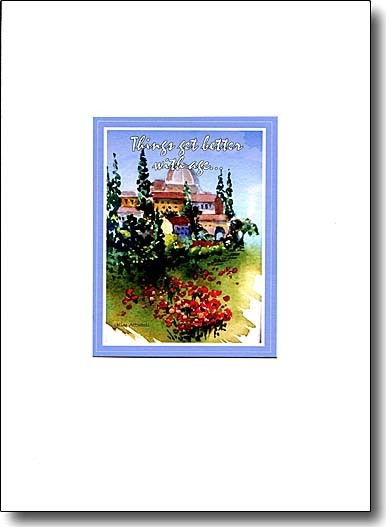 My painting of the Italian countryside lends itself to this fun saying. I sometimes write inside, "If you are a cheese". 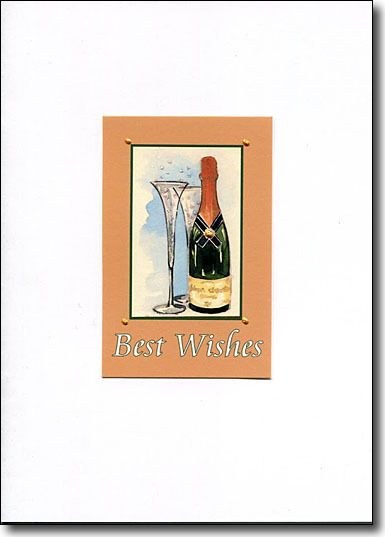 A sophisticated card for grownups to suggest that a touch of bubbly will aid the birthday celebration. 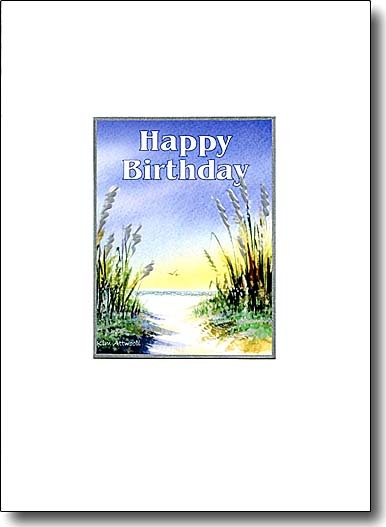 A beach lover's birthday card. The sea sparkles and the dune are enhanced with textural silver. Contentment! This image of our cat Ebenezer conveys pure contentment. 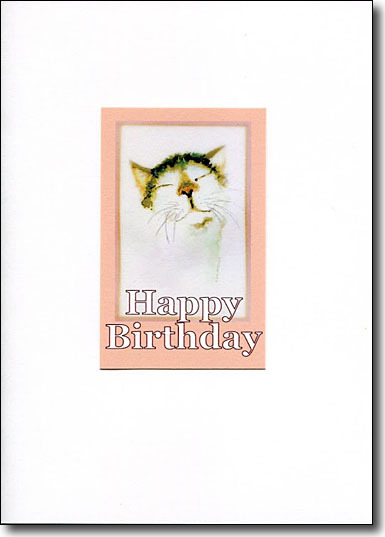 It's the perfect birthday greeting card for cat lovers. The cat's whiskers glimmer and his nose is wet with sparkles. 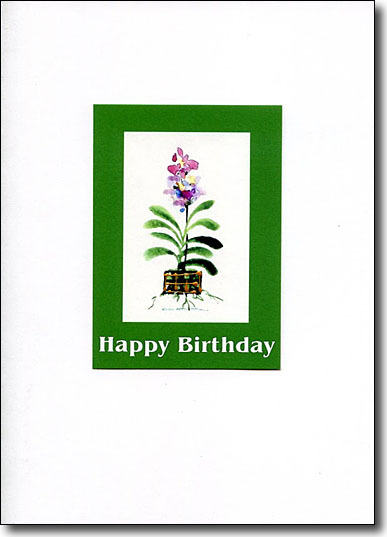 This exotic orchid in an air box is such a pretty way of sending birthday wishes. I use a metallic gold to embellish the box. 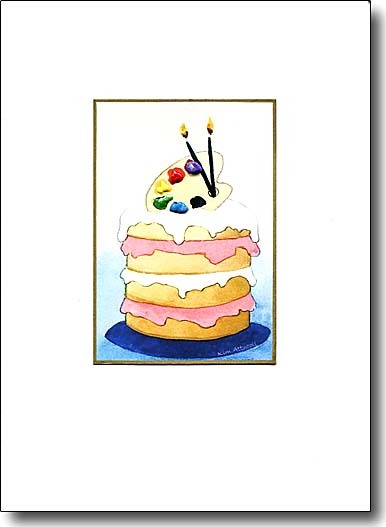 Bring a smile when you send this funny card by writing, "It's Another Birthday " inside. 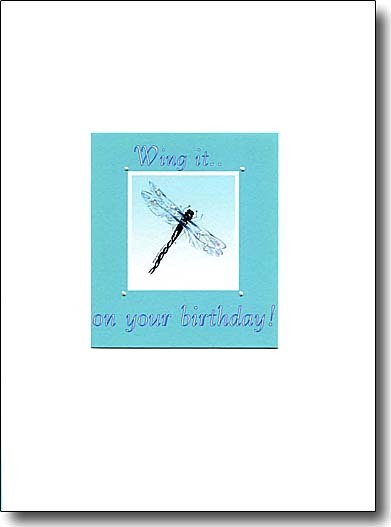 My dragon fly illustrates the wishes to make something special of your special day. The consummate birthday image. 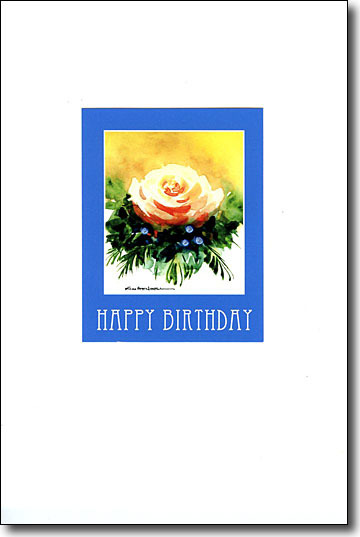 I embellish the flame atop the candle and the flowers around it. 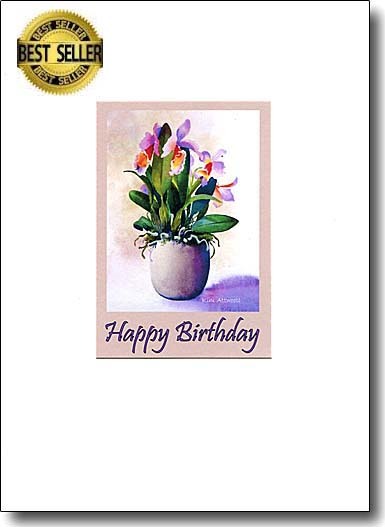 Birthday wishes on a soft watercolor of a luscious container of blooming orchids will delight all garden lovers. The embellishment is on the twisting tendrils of air roots. 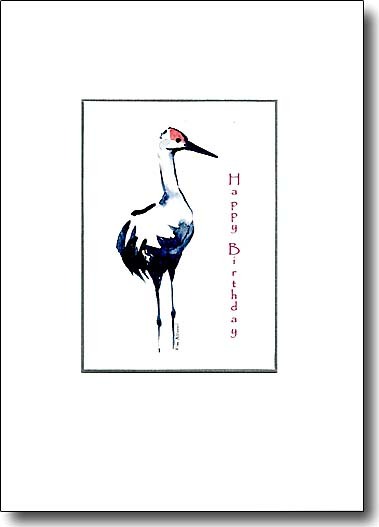 This slightly oriental image is a good masculine birthday card. 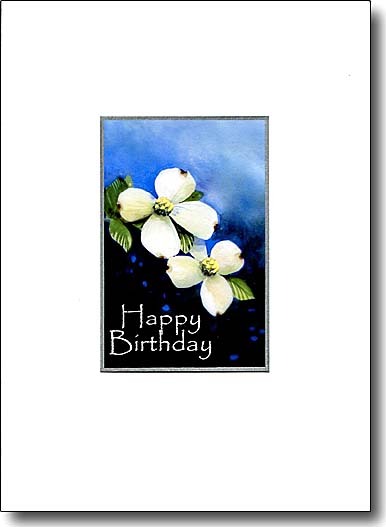 My brushstrokes are calligraphic but I think very effective. 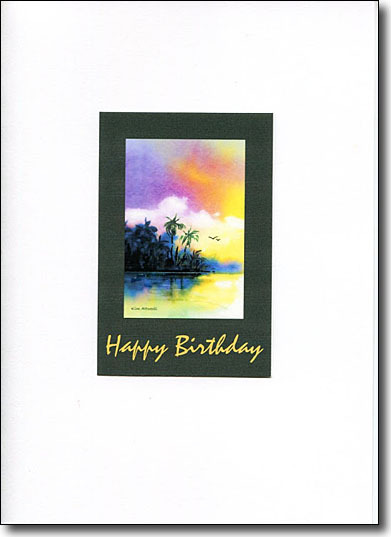 Here is a warm and exotic way to wish friends a happy birthday. They"ll love the fact that you picked such a unique card. This calm, peaceful painting captures a still and beautiful dawn. 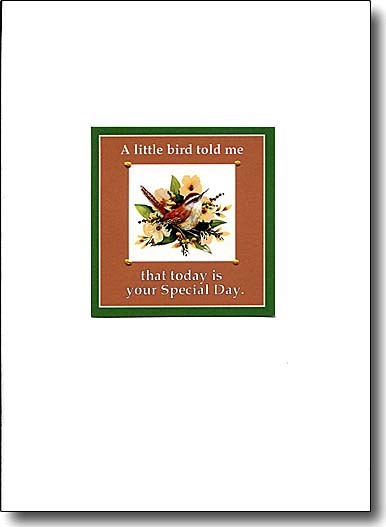 What a way to start your special day. 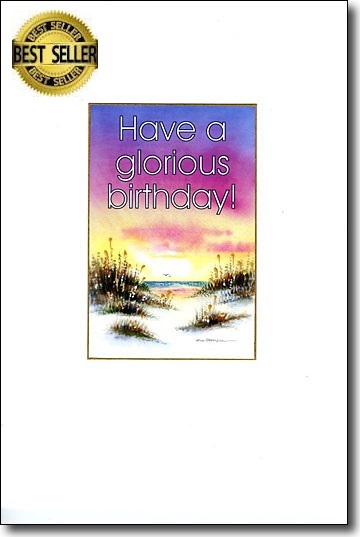 This is a celebratory birthday card. 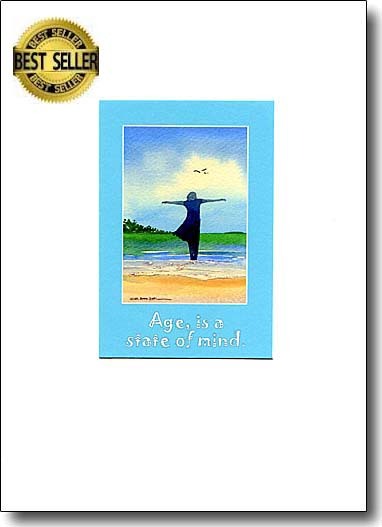 An ageless figure capturing the beach breezes in warm waters symbolizes well being. 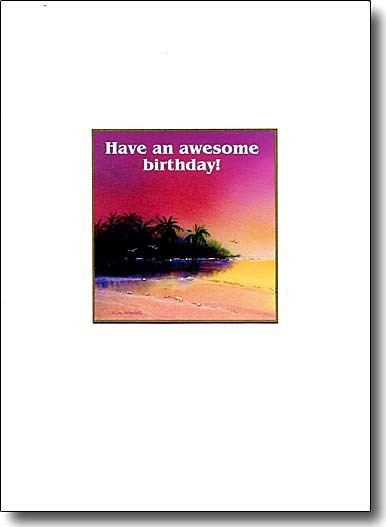 Here is a vibrant birthday greetings card. 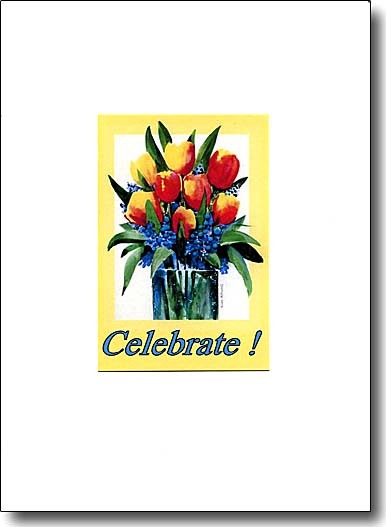 The flowers shout "Celebrate". I enhance the glass with sparkles and touch on the bluebell's color. 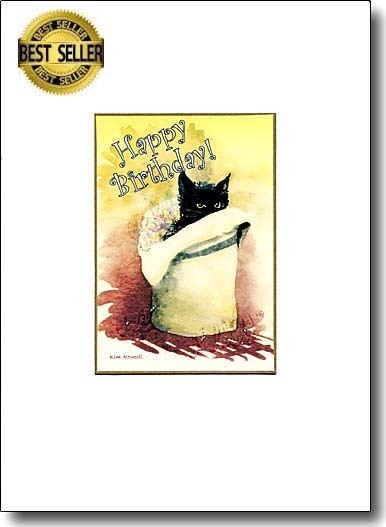 I painted this with a young student and turned it into a cat lover's birthday card. 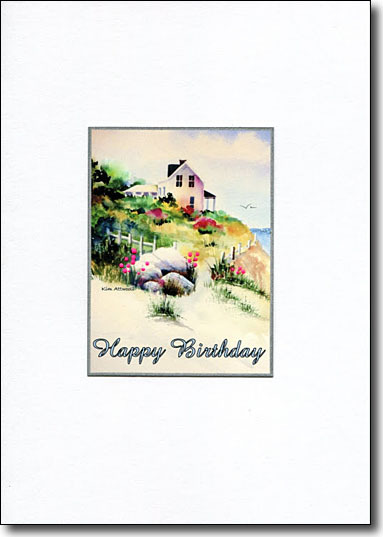 Here's an inviting landscape with birthday wishes on a soft robin's egg blue. The tall grass by the path is embellished with golden wheat tops. 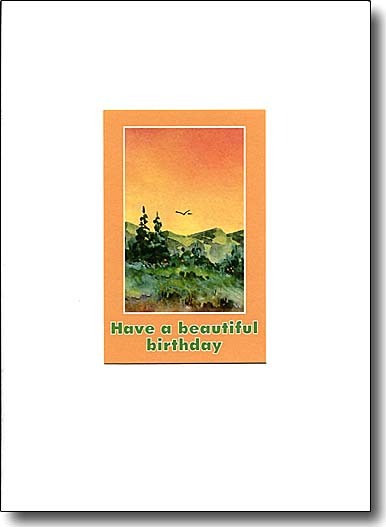 This image is a whimsical birthday card. 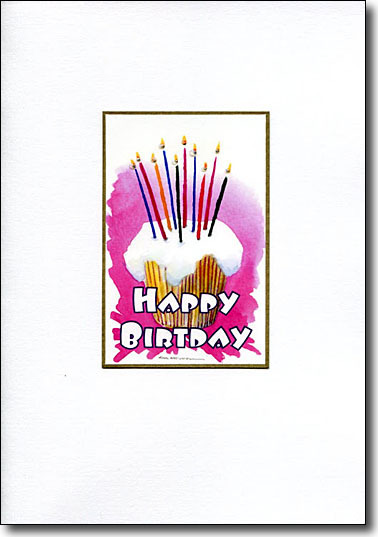 Each of the candles on the cupcake is alight with a touch of glitter. A mountain sunrise is always inspirational. 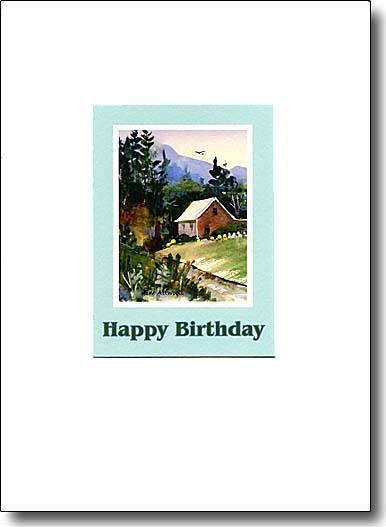 Send this mountain view birthday card to acknowledge the importance of making every moment of this birthday special. 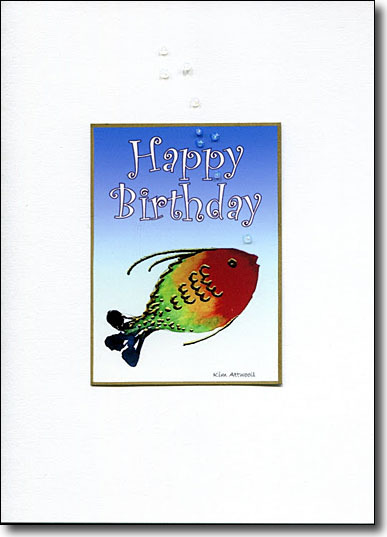 My fanciful fish is a colorful birthday card. 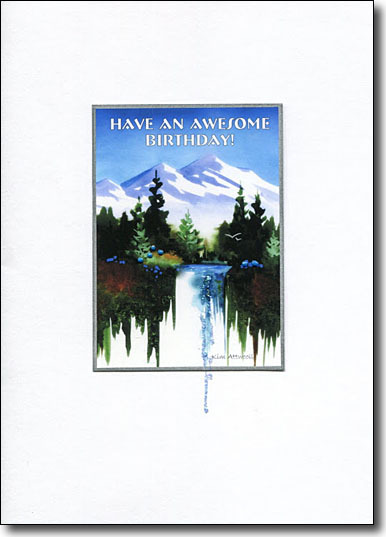 It blows luminescent bubbles through the greeting. A really unique card. This lowland scene offers a colorful view of calm and tranquility. 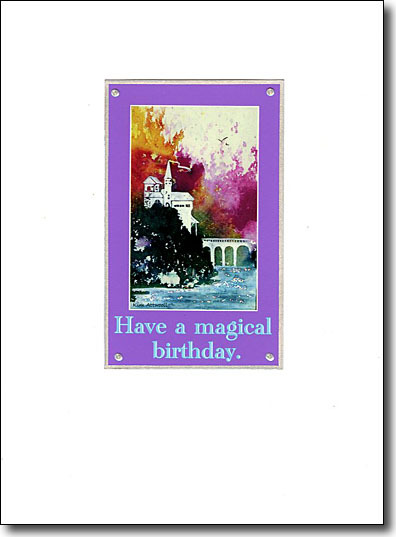 Choose this card with exciting contrasts. 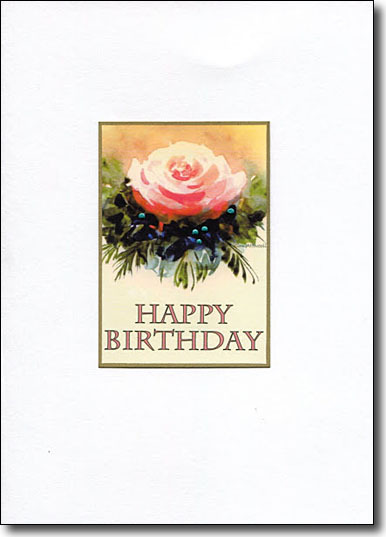 The dark background sets off the light flowers and a charming font wishes "Happy Birthday". A perfect picture to wish someone a beautiful day. 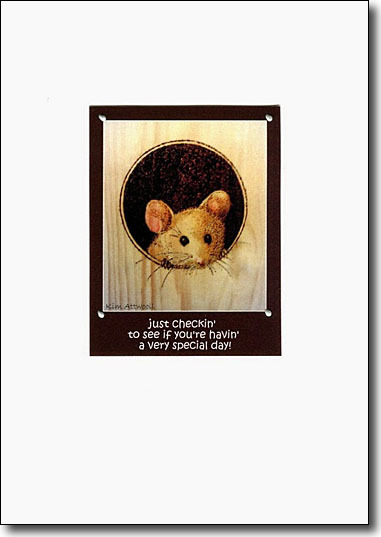 Perhaps a few of the real thing to accompany this card would be fun! 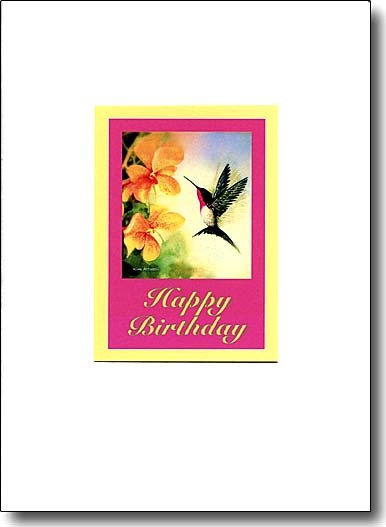 A hummingbird and orchid card is a colorful way of wishing the celebrant a very special day. I enhance the bird's wings with hologram glitter which gives the illusion of motion. I love this painting. 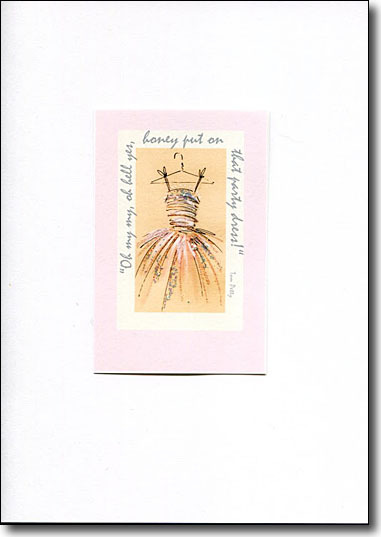 The watercolor artist Janet Rogers taught me how to capture a rose in this loose fashion. I add touches of turquoise to the warm golds to "up" the appeal. My tiny doll is adding some magic to your birthday wishes. This could also be a delightful "Save the Date" card. 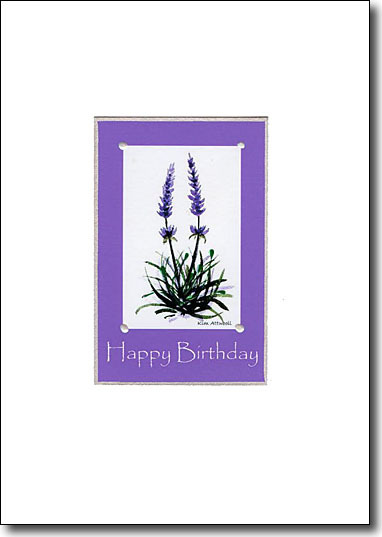 Here's a simple and pure image of Lavender with a complimentary font wishing "Happy Birthday". The flowers and leaves are gently enhanced with raised paint.